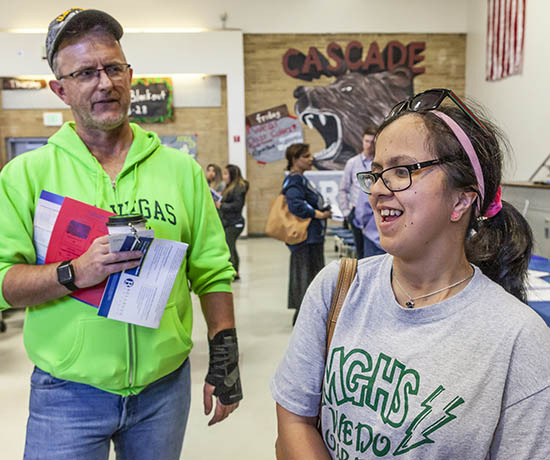 hundreds of people with developmental disabilities find help with careers, housing and other resources. EVERETT — Doors were opening for young people with developmental disabilities at the 22nd annual Snohomish County Transition Resource Fair. Help with jobs, college, transportation, housing plus medical, legal and financial aid were offered from more than 50 agencies. A few hundred teens, young adults, parents and caregivers drifted from booth to booth and into workshops, exploring their options. The fair was held at Cascade High School on March 25. Mindy Giammona, 17, was one of them. She and her father found something unexpected: opportunities to attend college. They hadn’t realized multiple local colleges including brick and mortar and online programs catered to students with disabilities. There were many accommodations available, though all students did need to turn assignments in on time, said Craig Kerr, the director of services for students with disabilities at Edmonds Community College. The transition to post-secondary education would be an adjustment so Kerr was there to help aspiring collegiates map out a clear, manageable path. An estimated 9,451 county residents have a developmental disability. Among the throng of young adults, a matchmaker stood expectantly. “I am like Match.com,” Pam Blanton of Partners4Housing joked. After more than 15 years as a housing specialist for King County, Blanton had identified a unique niche several years ago. Blanton is in the roommate finding business for adults with developmental disabilities. She understood the complex needs of clients who might need to share a live-in caregiver with a roommate to cut costs, or to fill the empty bedroom of a home a parent bought for their child with disabilities. While Blanton had some bites, many fair visitors were still high school students, not quite ready to move out yet. But they and their caregivers wanted to ensure their kids didn’t fall through the cracks, transitioning from the highly structured educational system to the post-high school void. “Our goal is to intervene in time so (graduates) aren’t sitting on a couch, just doing this or that from week to week,” said Lauren Caldwell of the state’s Division of Vocational Rehabilitation. The state agency works with clients who have conditions including cerebral palsy, Down syndrome, epilepsy and spina bifida severe enough to cause significant difficulties functioning. Some clients work in retail, others in grocery stores. For many, she explained, 10 hours of paid work per week provides a sense of pride and value while keeping them from being overwhelmed by a full-time job’s demands. Mom Angela Ziska and 15-year-old son Alexander Bridges, who has autism, were scoping out all their options. Bridges said he was interested in becoming a filmmaker, “but I am not the most social person,” he said. There were plenty of people to encourage him and back up the moral support with resources. Diamond Flowers was with his aunt Erica Rainford checking out the bus booth hosted by Snohomish County Transportation Coalition. Flowers was already in a life skills building program and had work experience but was looking to transition to paid employment. At the bus booth, employees provided visitors such as Flowers in-person guidance on how to navigate the bus system. They even assess what an easy travel range would be for clients based on where they live to help them figure out a workable commute distance. Street smarts lessons are part of the free service. “Can I have $5,” a staffer said she asked a client. When he went to hand over the money, she taught him to say he didn’t carry cash. At another booth, clients can get placed in local jobs with doctors, engineers and Lt. Gov. Cyrus Habib, said Gil Cupat of the state’s Department of Services for the Blind.